The recent study has brought out the facts that hand hygiene in healthcare unite is very poor, especially in the Intensive Care Unit (ICU). 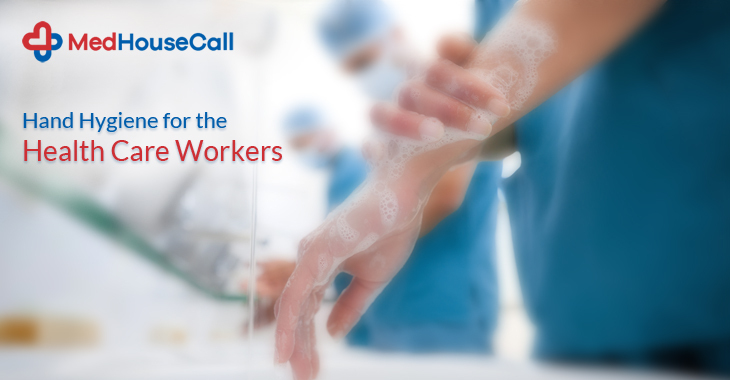 Healthcare workers are unknowingly spreading germs putting their health as well as the health of patients at risks. Despite the essential needs for infection control in the healthcare unit, not much has been done to take care of this factor. Hand hygiene is an important factor. MedHouseCall is a healthcare unit that offers the house call doctor service in Ontario, Canada. Doctors at MedHouseCall points out the factors that had hygiene should be maintained with a strict protocol in order to ensure a healthy atmosphere in the healthcare unit. It has been noted that the risk of spreading germs due to the poor hand hygiene is high when health workers are handling dirtier to cleaner patients. It increases the risk of spreading germs. This is why doctors prefer that healthcare workers must handle cleaner to dirtier patients to reduce the spreading of bacteria and germs. There are many organizations that research on this topic and they concentrate on how health workers maintain hand hygiene during the sequences of healthcare. While healthcare workers should understand the process of taking care of patients and adopt cleaner to dirtier approach, physicians are also supporting this process as it has shown that nearly 50% of physicians are accustomed to dirtier to cleaner treatments, which is a wring way to handling patients’ health. People associated with the industry are introducing some approaches that help to solve the issue. The right training is important for this. MedHouseCall, though, comes up with an innovative approach to offer medical services to patients in need. House call doctors will visit patients’ home for treatment so there is less chance for spreading germs from others. Hygiene is an important factor of the healthcare unit and it should be taken as a serious matter. Patients and healthcare workers are suffering from various health complications due to this problem. If you are looking for a convenient health care service, contact MedHouseCall. We are a healthcare unit offering services to patients in their home. Our team of doctors treats your complication in the best way. It is really difficult to maintain a healthier lifestyle in our busy days. Many people who overcome some serious health issues have shared their experience and raise the topic of maintaining a healthier lifestyle. When you stay active, the people and the things around you look beautiful. You feel an energy that helps you complete your work effortless. Staying active also protects you from different health complications. MedHouseCall is a healthcare organization that offers on-demand doctor house call services to patients in Ontario, Canada. Our doctors are sharing their views on how to stay active in maintaining some easy tips. Here are the details. Stressful life cannot give you an ideal option for maintaining your health. So, you need to de-stress yourself first. It is not really very hard to make you stress-free. You can listen to your favorite music for relieving stress. A soothing spa is another option that makes you feel relaxed. Doctors at MedHouseCall leave everything on people. We also offer in-home health care services where our doctors will visit your place and carry out a treatment process. Keep fruits and vegetables in your diet. They are good options for your health. World Health Organizations also recommends people to eat veggies and fruits daily to fight illnesses and diseases. To engage you with the eating healthy habit, we suggest you drinking mixed fruit and veggie smoothie that takes care of your health in a great way. Exercising is important when it comes to your health. If you don’t want to spend time in a gym, try alternatives that excite you and retain your interest, such as dancing, yoga, and hiking. Keep yourself hydrated as much as possible. Drink enough water and stay healthy. Remember that water improves your overall health. It is also necessary to take care of your mental health. Your thought leads you. So, it is up to you which way you want to go. Think positive and you can feel good. If anything bothers you, take actions to solve it immediately. Don’t think too much about that matter. A few good friends are enough for you. Cherish a healthy, friendly relationship and move ahead in your life. Our doctors always advise patients to maintain a healthy sleep. It is a good habit and makes you stronger when it comes to your health. Sleep can cure so many health problems. MedHouseCall brings to you these factors for your health. For any medical help, please contact us. We are offering on-demand doctor house call services in Ontario, Canada. We understand that people are busy with their works and they tend to ignore their health. Thinking it a minor health complication, they often skip a doctor visit. To make healthcare facilities convenient to people, MedHouseCall offers the Doctors on your own schedule service. After 40 years, women body has gone through so many changes, and metabolism and hormonal issues are very high at this time. It is important to maintain a healthy routine to stay active always. As the age advances, your bone density lowers and that causes problems like difficulty in walking, fragility, swelling, joint pains, and more. MedHouseCall is a trusted health organization in Ontario, Canada. It raises some health topics which are really necessary to consider. It comes up with an initiative to make healthcare facilities available to everyone. 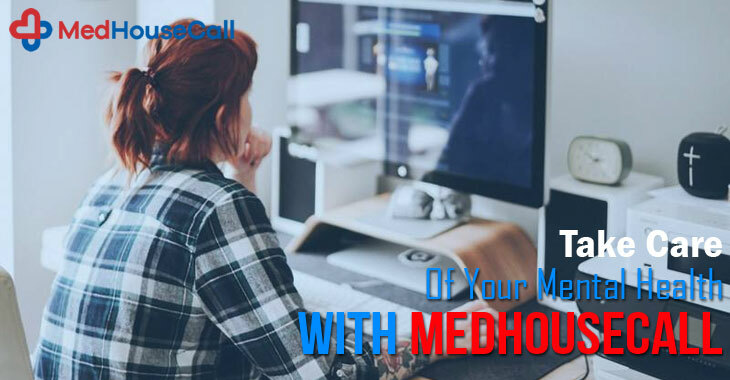 With MedHouseCall, people can book a doctor’s appointment at their home and get treated in their comfortable environment. On the occasion of International Women’s Day, this health organization raises the topic regarding women health after their 40. 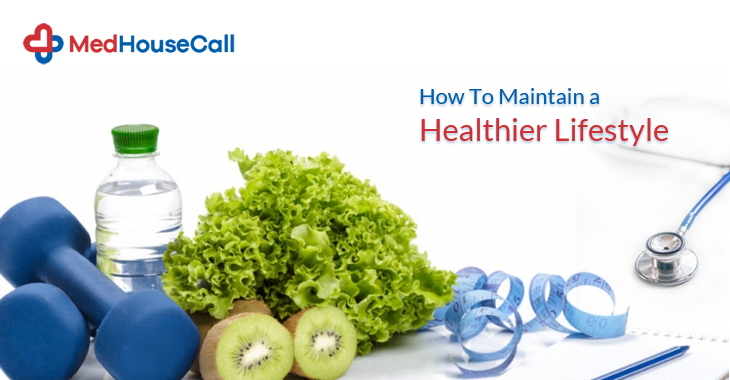 You must maintain some health tips and feel energetic. A decrease in oestrogen level is a common cause of menopause that has so many symptoms like dry skin. You must drink 8 glasses of water a day to moisturize and nourish your skin beautifully. When you drink enough water, it also reduces the problem of bloating. Calcium is a very essential mineral for your bone health. After your forty, your bone density lowers due to the hormonal changes. Doctors suggest that you must include dairy products in your diet to avoid these complications. Eat eggs, curd, cheese, milk, and more for your health. Vitamin D is needed and it helps your body to absorb the calcium. Though we all know that vitamin D comes from the sunlight, eating tuna, eggs, and meat helps your body to have vitamin D.
Fruits and veggies are always good for your health. Since your metabolism slows down with your age, you must consume low calorie and high fiber foods that prevent weight gains. 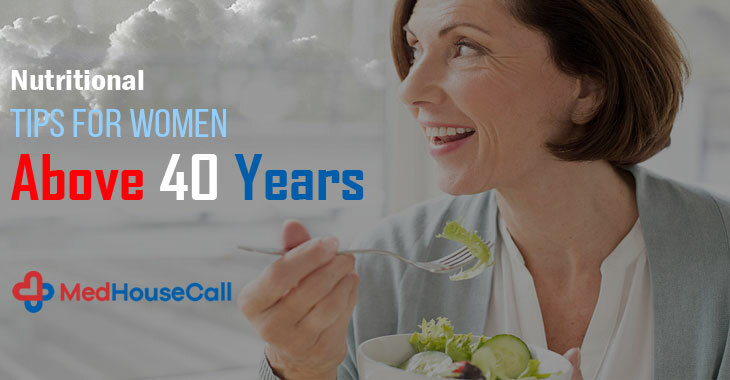 Women are likely to suffer from iron deficiency and the chances are high when you cross 40 years of your age. Consume iron-rich foods for your health and avoid all complications related to it. Flaxseeds are the rich source of Omega 3 and they are beneficial for women’s health. It balances your estrogen level and keeps your arteries healthy. 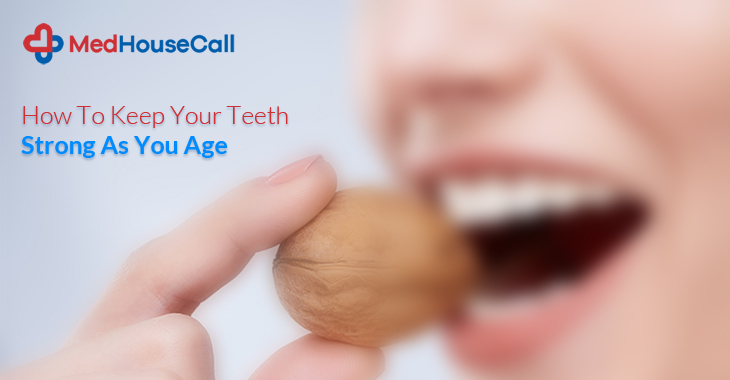 MedHouseCall understands the importance of staying healthy at this age. These health tips help every woman. You need to be concerned about your fitness and do necessary works that keep you stay active. For any health assistance, contact MedHouseCall. We are offering the Best Doctors At Home in Canada. Book your appointment with us and feel relaxed. Our home visit physicians will treat you at your convenient place. When we are talking about our health, some people unquestionably think about physical health only. But the most important issues are attached to your mental wellbeing. While we have so many things to maintain a healthy life, we often give no attention to what our brains need and what our psychology demands. Stress and depression are very common and everyone is suffering from these issues more or less. If you need a doctor’s help to deal with your problem, we at the MedHouseCall will make a special arrangement for you. Consult with our specialists at the comfort your home with us. We are offering doctors on your own schedule service in Ontario, Canada. When you are unhappy, it increases the burden on your mental health. Here, we offer you some easy but effective tips to get rid of this problem on your own. These tips discuss simple lifestyle changes that benefit you in many ways. Five minutes every day are enough to take care of your mental health. Spend time quietly as it empowers you. Switch off your phones and computer and sit silently without lights. Don’t think of your troubles and focus on your breathing. These easy meditation tips keep you feel relaxed. When you take a breath before you speak, your breath guides your speak. Exercising improves your self-esteem and helps think better. It also helps you keep your brain and other organs active. You need to eat well if you want your brain functions properly. It needs essential nutrients. Avoid drinking too much alcohol and junk foods. Drink plenty of water. You must avoid foods that make you feel sluggish and weight gain. This is a secret of keeping your mental health happy. Do things you are good at and it will make you feel better. When you finish a task by giving your 100%, it generates a feeling of fulfillment. Enjoy your work and it will never make you bored. Avoiding stress is really difficult. But, stress makes you feel anxious and increases your mental burden. If something makes you stressful, you must talk about the matter with relevant people who can solve this problem. 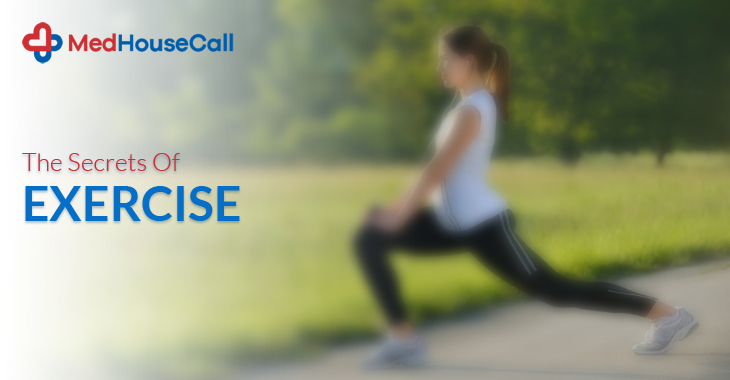 MedHouseCall will help you get the best healthcare services at your home. We understand that when an emergency occurs, you feel confused about where to go. We are always there with you. Call us anytime you need our help. Our home visit physicians will take minimum time to come to your place for medical assistance. Employee happiness is a tough area to cover for companies. Since the demand for well-being is different, generalizing things will not bring a big change. It has proven that around 40% of workers are suffering high-stress issue that will impact the productivity of a company. You need to manage a working culture that has enough refreshments for employees. 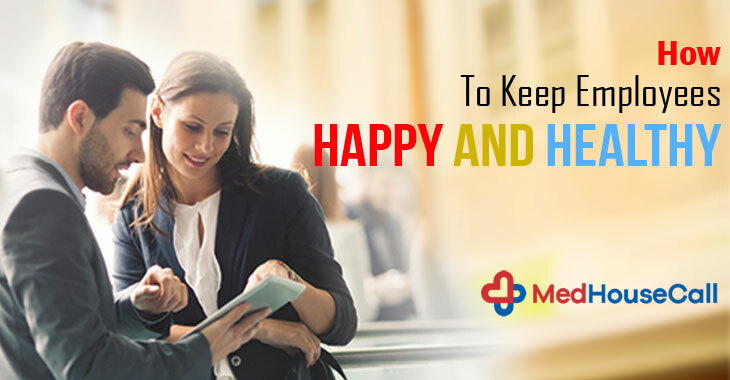 MedHouseCall is concentrating on the factors that help employees stay happy. 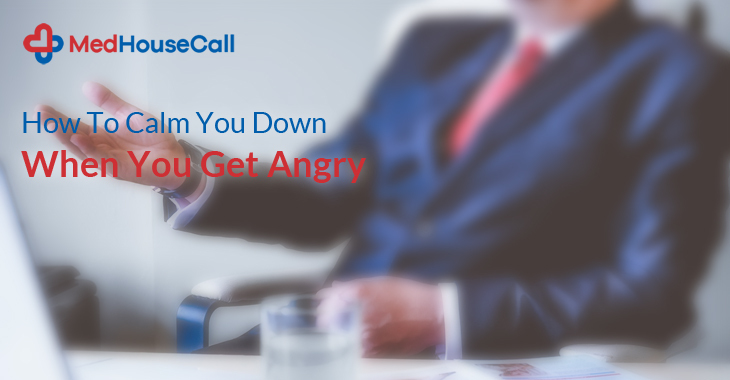 Professional pressure can disturb the psychological peace and it leads to a bigger problem. Before the situation becomes complicated, you need to adopt some strategies. We are offering doctors on your schedule service to people living in Ontario, Canada. We are also raising awareness for health and wellness. Today’s companies are considering health as one of the most essential factors for job performance. This is why workforce programs have gone through a massive change. Employers are making big changes in their rules and they extend benefits beyond the reduced insurance costs. MedHouseCall request every company to join the drive and offer maximum benefits to their employees so that they can feel healthy and happy. Since employers are ready to take action to improve the working environment in an office, holistic and flexible working hours have been introduced that help employees to give their best and allows employers to use the maximum creativity. Every employee demands for separate changes and benefits. But, it is really hard to point them out as a whole. Some companies offer incentives plans so that employees feel motivated always. Community engagement activities come up with great help to maintain a strong relationship with employers. Build community with employees and share information with them. As everyone is using social media for communication, building a strong relationship will not be a difficult thing. Many employers adopt modern office rules to help employees take care of their health. There are a few things that you can introduce as part of the modern work culture. Sitting for a long time is not a healthy choice. To erase this issue, companies are now using a standing desk. These desks help you sit or stand while working. Sometimes, employees are suffering from the occupational allergies that are caused by chemicals used in paint, carpeting, and furniture. The symptoms of these allergies reactions are rashes, irritated eyes, sinuses, and more. 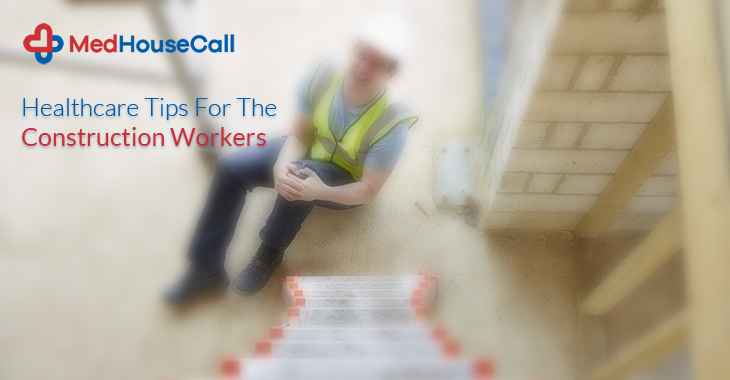 If your employees are suffering from these problems, you must change carpeting and furniture. You can also buy an air purifier to make the environment refreshed and clean. MedHouseCall is offering in-home healthcare services for the people in Ontario, Canada. This initiative is widely accepted by people and we soon extend our services to other places. If you want to consult with our doctors, book an appointment at your convenient place. We will be happy to solve your problem. Are you doing a desk-job? Sitting in front of your computer screen for a long time causes different health hazards. But you don’t have any options. You are compromising with your health every day. There are a few common health issues that prolonged sitting causes are joint pain, serious health risks, heart diseases, type-2 diabetes, and more. MedHouseCall raises concerns about these factors. We concentrate on common health issues so that people can take necessary care for their health. We are offering home visit doctor services to people who are unable to move from their home. Making healthcare facility convenient to patients, we are offering simple ways to get rid of illnesses easily. The working environment of the office should be changed so that employees will get maximum relaxation while doing their work. As long as productivity is concerned, employers must arrange separate facilities that keep people active and healthy. While many big companies have adopted the ideas of refreshment, many are yet to come up with the options. 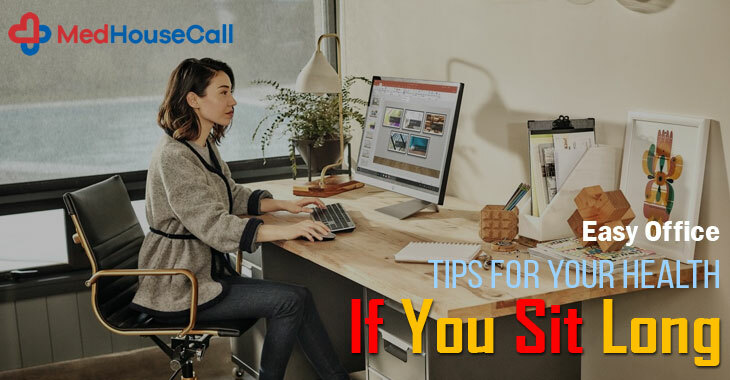 If you are sitting for a long time before your computer, make sure that you follow these tips to avoid health risks. Your monitor position and eye contact level must maintain the standard. It is said that the top of the screen should level with your eyes so that when you see the screen down, it creates a 10-degree angle with your eyes. If the screen is set too low, you may suffer from head and back pain. Reduce the brightness of your display screen, to avoid dry eye syndrome. If you are sitting too long, stand up. It makes you feel better and energetic. It also reduces the boringness in your office. Research has proved that a simple stand up after a long sitting can increase the sense of well-being. Office-based employees are having poor posture as they tend to keep their necks forward and stay closer to the screen. This can cause strain in the neck and spine. Chiropractors generally recommend chin retraction to improve your sitting habit. MedHouseCall is a well-known health organization offering in-home health care facility to people. We are touching those common factors that you face every day. Our aim is to improve the general health of people. Those who are doing desk jobs are suffering from poor eye health. It recommended improving the lighting of your desk. It prevents glare and computer vision syndrome. You can also avoid things issues like eye strain, eye fatigue, dry eye, blurred visions. It relies more on our psychological factor. Stay close to nature. A leafy, green plant improves your energy and creativity. It also enhances psychological perspectives and memory. Drink enough water to avoid dehydration. Desk job employees become more water deficient. So, stay hydrated always. It also improves your cardiovascular health. MedHouseCall offers Doctors on your own schedule. You can book a doctor’s appointment as per your convenient. We keep our services available to the people in Ontario, Canada and will soon expand our service network.